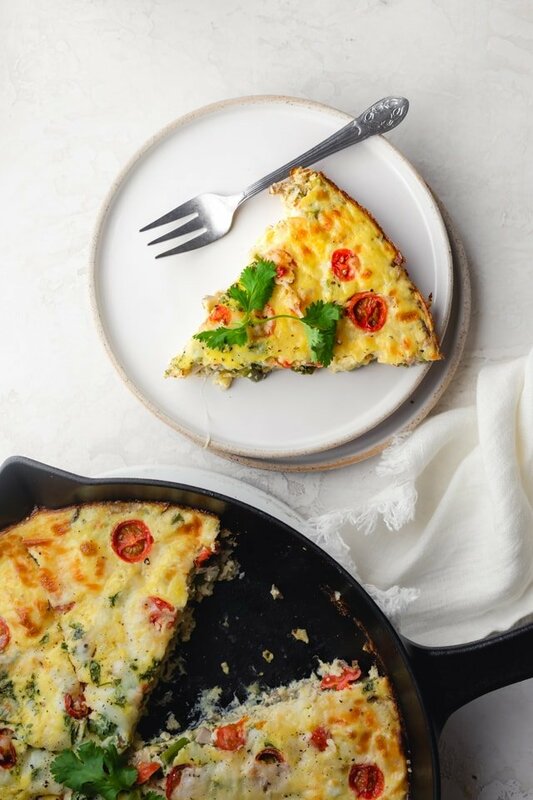 Vegetable frittata is a great way to use up leftover vegetables to make an easy inexpensive vegetarian meal that works for breakfast, lunch or even dinner. You know me, I’m all about maximizing the flavor of minimal ingredients and reducing waste in the kitchen. 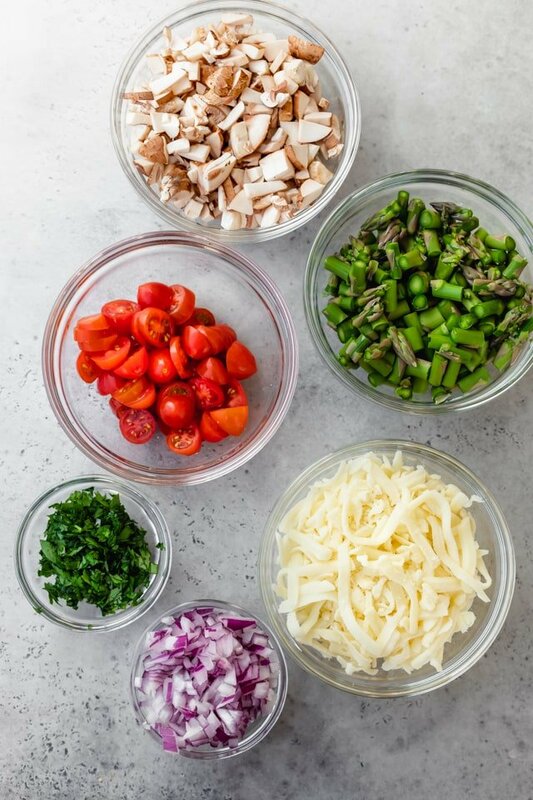 One of the best ways to use up leftover vegetables, cheese and herbs is by making a vegetable frittata. 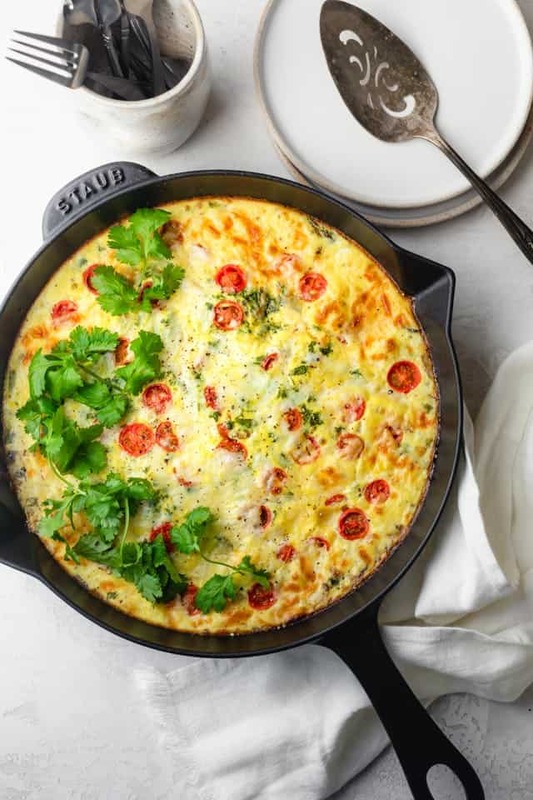 It’s pretty much like a baked omelette or a crustless quiche that’s perfect for breakfast, but can double as brunch, lunch or even dinner! It feeds a crowd with minimal effort on your part. Ok but first, what is a frittata really? Well, it’s actually an Italian recipe. Frittata is meant to use up leftover vegetables, cheese, meat and herbs and bake them with eggs. Many say that a frittata is like a fancier omelette or an easier quiche. It’s fancier than an omelette because we bake it in the oven. And unlike a quiche, you don’t need to make a crust or use cream while beating the eggs. The great thing about making frittata is that you’re not actually supposed to go out shopping for the ingredients (with the exception of the eggs). You’re supposed to use those mushrooms that are about to go bad, that asparagus leftover from making asparagus soup, the herbs that are wilting and that frozen cheese that is about to expire. You get the point. And now, let’s get to the point of a guide for how to make a frittata. Eggs: It’s the one ingredient that you can’t substitute and essential for making frittata. Depending on the crowd you’re feeding and the size of your skillet, I would recommend anywhere from 6 to 12 eggs for the recipe. Vegetables: This is where you can get creative with what you have on hand and the flavors you enjoy. For my vegetable frittata, I kept it simple with red onions, mushrooms and asparagus. Other vegetables that work well are potatoes, bell peppers, spinach, kale, zucchini, broccoli and tomatoes. Cheese: Just like with the vegetables, you can pretty much use any cheese you like. Use something that melts well and has great flavor like mozzarella, cheddar, gouda, gruyere, havarti, fontina or swiss cheese. I like to fold some cheese with the beaten eggs (optional) and sprinkle some on top (not optional haha) for cheesiness all throughout the frittata. Herbs & Spices: Fresh herbs like cilantro, basil, parsley or chives are very popular in frittata. 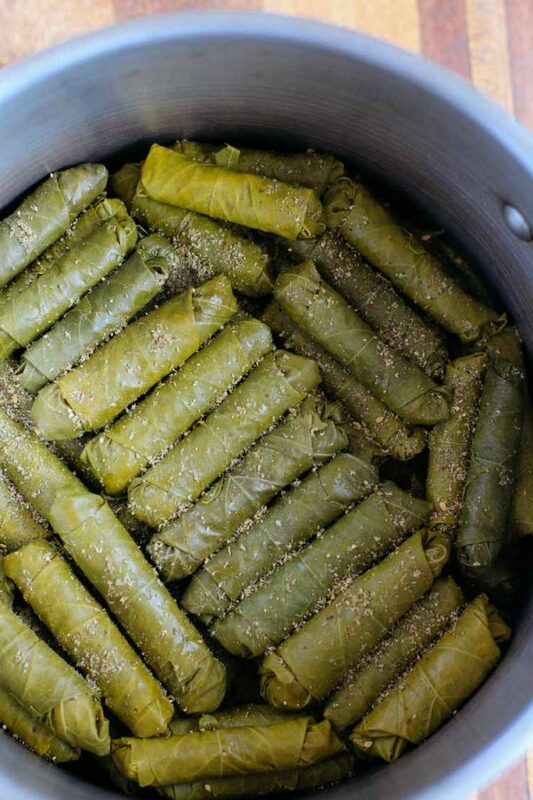 You can include them with the beaten eggs or sprinkle them on top of the dish before baking. For spices, keep it simple, but Italian seasoning works well, in addition to garlic powder, red pepper flakes and paprika. Dairy (optional): If you’d like to add some protein and make the frittata more creamy (and delicious! 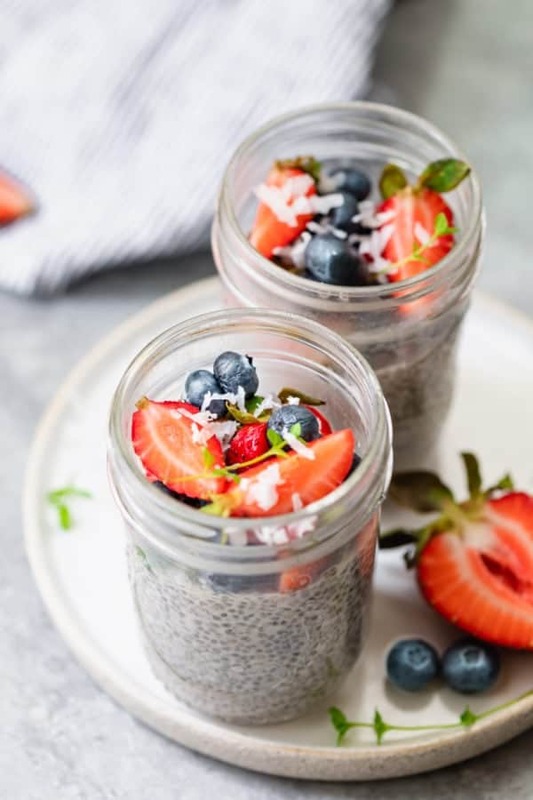 ), you can add milk, heavy cream, half and half, sour cream or even regular yogurt or Greek yogurt. Opt for full fat for best flavor! For every 6 eggs, use 1/4 cup dairy. Start by beating the eggs together, then whisking in some cream or yogurt if you’re using it. Add some of the cheese, salt and pepper and any other spices you might be using. Next, saute the vegetables together with some olive oil until they soften slightly. It’s a great idea to use a well-seasoned cast iron skillet. You can use on the stovetop to saute the vegetables and then transfer to the oven to finish cooking. Make sure to cook the vegetables fully because they won’t cook much after adding the eggs on top. This also helps them release their moisture so they don’t affect the consistency of eggs. Then, carefully pour the beaten eggs mixture over the sauteed vegetables in the cast iron pan. Next toss in any herbs you’re using, sliced cherry tomatoes and the remaining cheese. Bake the vegetable frittata in the preheated oven until the eggs are set. 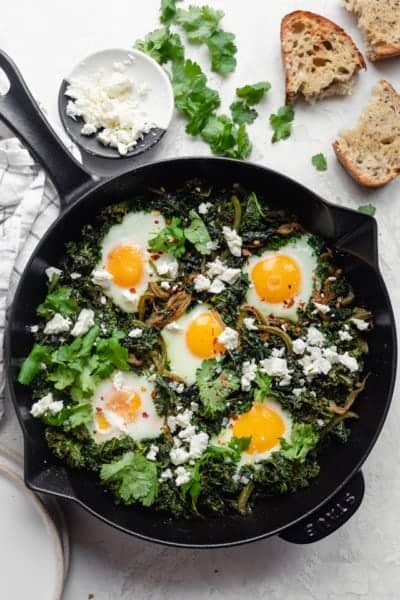 Use an oven-safe non-stick skillet or well-seasoned cast iron pan. This way you’ll minimize on the number of pans or dishes you’re using. This also helps give the frittata the best flavor since the vegetables are sauteed beforehand in the same skillet used to bake the recipe in the oven. Use a baking dish if you don’t have an oven-safe pan. This works just fine though in a baking dish if that’s all you have. Just make sure to still cook the vegetables completely beforehand in a pan. Then lightly grease a baking dish, transfer the vegetables to it and pour the beaten eggs on top of the vegetables. Don’t cook all the vegetables at once. Start with heartier vegetables like onions, potatoes and peppers. Finish with tender greens like spinach or kale. And if you have leftover vegetables from a previous meal, just toss them in long enough to heat through. Be careful not to over-bake the frittata. You want to cook frittata until the eggs are just set and no longer runny. If you want the cheese to get golden brown, place it under the broiler when the eggs need a few more minutes. The cooking time will vary based on the thickness and amount of vegetables you use, so watch it carefully. 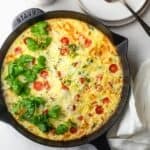 This vegetable frittata is baked egg goodness! 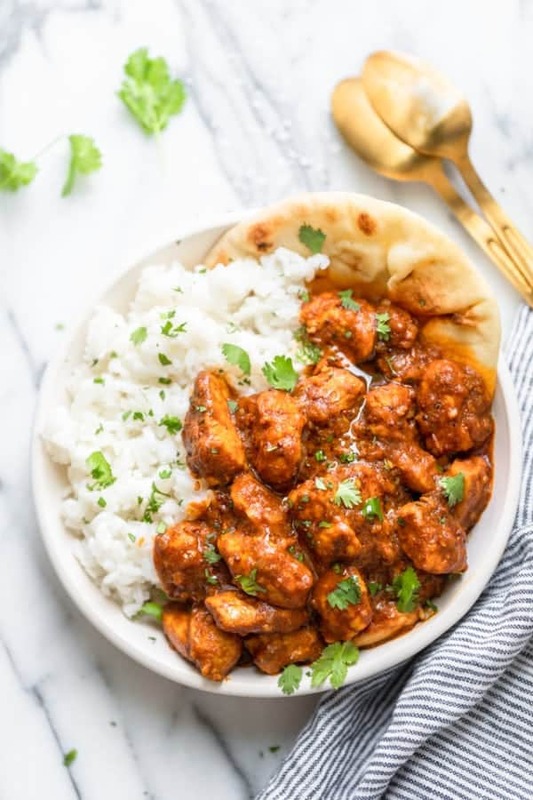 It’s so easy to make, perfect for cleaning out the fridge and great for feeding a crowd! 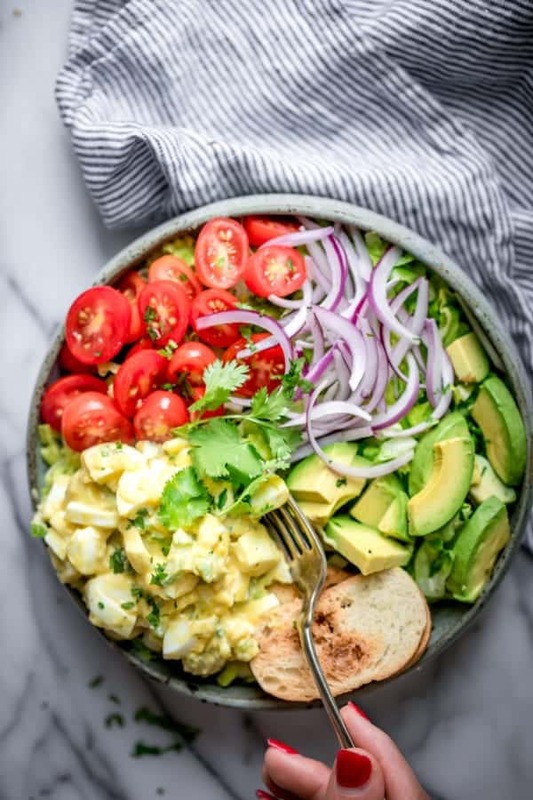 Frittata also stores pretty well, so feel free to enjoy it the next day on a bagel or English muffin for a quick and easy breakfast. 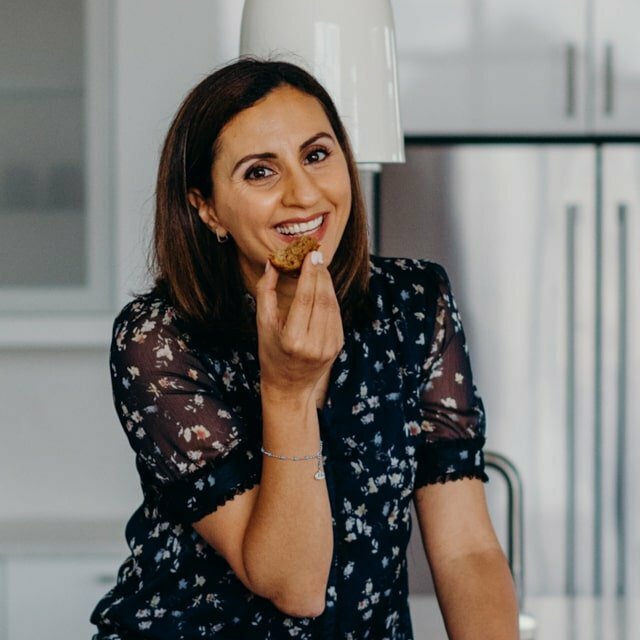 I love this healthy, protein-packed recipe that limits food waste in a creative delicious way! 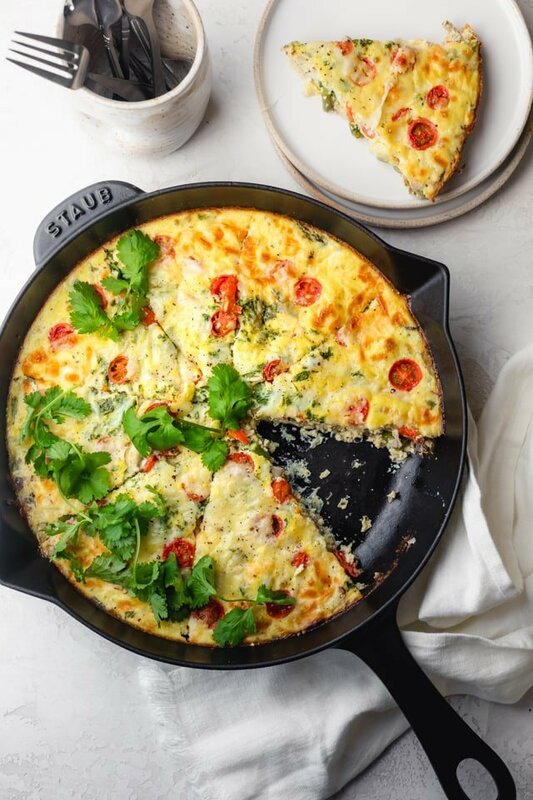 If you’ve tried this healthy-ish feel good Vegetable Frittata recipe or any other recipe on FeelGoodFoodie, then don’t forget to rate the recipe and leave me a comment below! I would love to hear about your experience making it. And if you snapped some shots of it, share it with me on Instagram so I can repost on my stories! Whisk together the egg, yogurt, half the shredded mozzarella cheese and salt & pepper; set mixture aside. Heat olive oil in an oven safe pan or cast iron pan. Add onions, mushrooms and asparagus and cook for 3-5 minutes until the vegetables soften. Pour the egg mixture on top of the cooked vegetables. Place sliced cherry tomatoes on top and add the remaining cheese. Storage: Store any leftovers in an airtight container. They will last up to 3 days in the fridge. 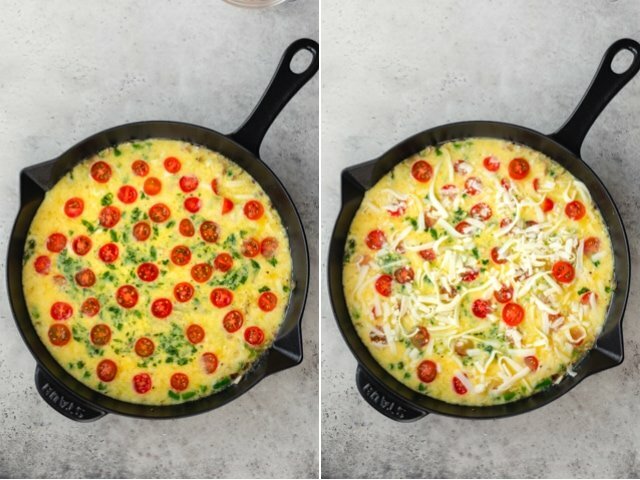 Freezing Instructions: You can also freeze the frittata for up to 3 months. To re-heat, thaw in the fridge overnight and bake in a 350°F oven until heated through. I would avoid reheating in the microwave though because it may let out too much moisture from the vegetables and have a rubbery texture. Yogurt is totally optional. Instead of yogurt, you can use ricotta or sour cream for a more rich texture. You can also use regular milk, or plant based milk. You can substitute the vegetables for any others. Feel free to replace the cheese with any other you'd like. Nutrition: Please note that the nutrition label provided is an estimate based on an online nutrition calculator. It will vary based on the specific ingredients you use. This information should not be considered a substitute for a professional nutritionist’s advice. The nutrition value is for one serving, which is about 1 1/2 eggs plus the vegetables I use. Using other vegetables will change the nutrition information. This looks like such a great fritata!